A sinus is a cavity in a bone; in particular, one of the air-filled spaces, known as facial sinuses or paranasal sinuses (see below), in the bones surrounding the nose. The term "sinus" also refers to any wide channel that contains blood, or an abnormal, often infected, tract. A facial sinus is any of the air-filled cavities in the bones that surround the nose. 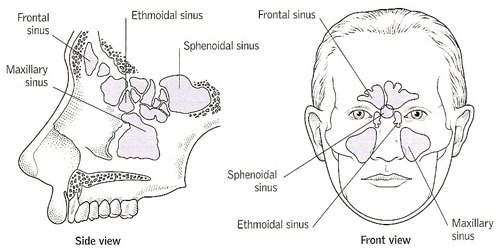 Facial or paranasal sinuses include the two frontal sinuses that are situated in the lower forehead; two ethmoidal sinuses between the eyes; two maxillary sinuses in the cheekbones; and the sphenoidal sinuses in the skull behind the nose. The facial sinuses decrease the weight of the skull and alter voice resonance. Each sinus is lined with mucous membrane; and mucus drains along a channel that opens into the nose. Sinusitis is inflammation of the membranes lining the facial sinuses. It is most often due to infection, usually spread from the nose. The maxillary and ethmoidal sinuses are most commonly affected. Sinusitis may case pressure, headache, facial pain, and a feeling of fullness in the affected area; there may also be a fever, a stuffy nose, and loss of the sense of smell. A common complication is the formation of pus, causing pain and nasal discharge. Treatment is usually by steam inhalations and a decongestant, but in some cases antibiotics may be necessary. If sinusitis persists despite treatment, surgical drainage of the affected sinuses may be performed.